"Battle of Sluis" redirects here. For another battle that was part of the Eighty Years' War, see Battle of Sluis (1603). The Battle of Sluys (/ˈslɔɪz/; Dutch pronunciation: [slœys]), also called the Battle of l'Ecluse, was a naval battle fought on 24 June 1340 between England and France, in the roadstead of the port of Sluis (French Écluse), on a since silted up inlet between Zeeland and West Flanders. The English fleet of 120–150 ships was led by Edward III of England and the French of 230 by the Breton knight Hugues Quiéret, Admiral of France, and Nicolas Béhuchet, Constable of France. It was one of the opening engagements of the Hundred Years' War. Edward sailed from the Orwell on 22 June and encountered the French in Sluys harbour. His fleet spent some time manoeuvring to gain the advantage of wind and tide. The French bound their ships into three lines, forming large floating fighting platforms. During the battle the French navy was almost completely destroyed, with most of their ships being captured. They lost 16,000–20,000 men killed, against slight losses to the English. The battle gave the English fleet naval supremacy in the English Channel. However, they were unable to take strategic advantage of this and their success barely interrupted French raids on English territories and shipping. Operationally the battle allowed the English army to land and to then besiege the French town of Tournai. Since the Norman Conquest of 1066, English monarchs had held titles and lands within France, the possession of which made them vassals of the kings of France. French monarchs systematically sought to check the growth of English power, stripping away lands as the opportunity arose. Over the centuries, English holdings in France had varied in size, but by 1337 only Gascony in south western France and Ponthieu in northern France were left. The Gascons had their own language and customs. A large proportion of the red wine that they produced was shipped to England in a profitable trade. The trade provided the English king with much of his revenue. The Gascons preferred their relationship with a distant English king who left them alone, to one with a French king who would interfere in their affairs. Following a series of disagreements between Philip VI of France (r. 1328–1350) and Edward III of England (r. 1327–1377), on 24 May 1337 Philip's Great Council in Paris agreed that the Duchy of Aquitaine, effectively Gascony, should be taken back into Philip's hands on the grounds that Edward was in breach of his obligations as a vassal. This marked the start of the Hundred Years' War, which was to last 116 years. The English did not have a purpose-built navy. Edward owned only three warships. They relied on requisitioning cogs, the merchant vessels of English traders. Cogs had a deep draught, a round hull and were propelled by a single large sail set on a mast amidships. They were converted into warships by the addition of wooden castles at the bow and stern and the erection of crow's nest platforms at the masthead. The cogs had a displacement of 200–300 long tons (203–305 t) and were able to carry many fighting men. Their high freeboard made them superior to the oared vessels in close combat, particularly when they were fitted with the castles from which missiles could be fired or stones dropped on to enemy craft alongside. By English common law, the king was required to compensate the owners of ships impressed into service, but in practise he paid little and late, which caused shipowners to be reluctant to answer summonses to arms. In March 1338 Portsmouth was captured and razed by French galleys. Five English ships carrying wool were captured off Walcheren in September after a fierce fight known as the Battle of Arnemuiden. The lost ships included two of Edward's three warships: the Christopher and the "great cog" Cog Edward. In October the major port of Southampton was captured and burnt down. In 1339 it was the turn of Hastings. In 1339 there had been discontent among the Genoese mercenaries hired by the French, whose commander had not been passing on their pay. Believing that the fault lay with their French paymasters a deputation sought an audience with the French king, Philip VI, in August. He jailed them, causing the Genoese crews to mutiny and return to the Mediterranean. When the mutinous sailors arrived back in Genoa they led an uprising which overthrew the ruling patricians. The new regime was disinclined to enter into new contracts with the French. When several ship captains were persuaded to, they were bribed by English agents to renege. 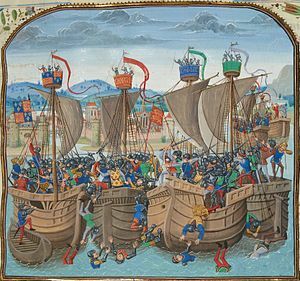 In January 1340 the English successfully raided Boulogne, where the majority of the French galley fleet was drawn up on the harbour beach and was inadequately guarded. Taking advantage of a mist the English surprised the French and destroyed 18 galleys, 24 other ships, large stocks of naval equipment and much of the harbour district before being driven off. The French were left with only 6 galleys, which they supplemented with 22 oared barges. Although Gascony was the cause of the war, Edward was able to spare few resources for it, and determined to campaign with his main force in north eastern France in 1340. An April offensive by Edward's continental allies failed and a French offensive commenced on 18 May. It met with mixed fortunes, but Edward's outnumbered allies were desperate for the English army to reinforce them. Edward had planned to ship his army to Sluys, in Flemish Zeeland, in mid-April, but most English merchantmen, aware that they were unlikely to receive the payments they were entitled to, were refusing to muster. The departure date was repeatedly postponed. On 4 June the King's Council decided to sail with what ships they had, even though they could only carry 600 men-at-arms. On 10 June the Council received news that the Great Army of the Sea had arrived at Sluys on the 8th with consternation. Sluys was the main port of Flanders and had long been used by French and Genonese warships, despite Flanders having had its neutrality recognised by both sides. Quiéret and Béhuchet had cut English communications with the continent. As they blocked the roadstead a further 10 ships reinforced them, bringing the total French strength to 213 ships. An acrimonious meeting of the Council took place. John de Stratford, Archbishop of Canterbury, a senior advisor, insisted that putting to sea would risk the loss of the King and that the whole expedition should be cancelled. The men in charge of the shipping arrangements were personally abused by the king. Stratford stormed out of the Council. In a fury Edward declared that "Those who are afraid can stay at home". A string of instructions went out. Coastal defences were stripped. Peremptory orders were sent to royal officers to brook no excuses from tardy mariners. Edward personally harangued the shipowners of Yarmouth, the largest port in England. Meanwhile, the horses which had already been loaded were unloaded and the erstwhile transports were rapidly converted to warships by having forecastles, aftercastles and crow's nests added. To general amazement a sizable fleet had been assembled at the Orwell by 20 June. The payroll records for the English fleet have been lost, so historians have relied on the estimates of chroniclers to ascertain the size of the fleet. 66 ships which sailed with it have been identified by name and it is believed that it totaled between 120 and 150 ships. Edward's lieutenants were the Earls of Northampton and Huntington. The fleet set sail early on 22 June 1340 and was in sight of the roadstead at Sluys by the afternoon of the following day. Edward anchored at Blankenberge and in the evening sent ashore Reginald Cobham, Sir John Chandos and Stephen Lambkin to reconnoitre the French fleet. When the English were sighted the French fleet organised itself in three lines across the three miles wide estury of the Zwin. The ships of each line were bound together with chains and ropes to prevent the passage of enemy ships, "like a line of castles". Several large ships were stationed in the front of the line, including the very large captured English prize the Christopher. This was a normal medieval tactic for a fleet fighting on the defensive. Admiral Barbavera, the experienced commander of the galleys, was concerned about this. He realised that they would lack manoeuvrability in their anchorage and be open to attack from the ship-based English archers. He advised the French commander to put to sea and gain the weather gage, so as to be able to attack the English while they were disembarking, or deter this by the threat of an attack. Béhuchet, who as constable exercised overall command, knew little of naval operations. He viewed Barbavera as a mere commoner and near pirate, and wishing to take no chances of the English slipping past insisted on holding a position blocking the inlet. Edward's intentions were well known; he wished to sail up the Zwin to Bruges and land his army to support his hard-pressed allies. The French were anchored at the entrance of the Zwin (also Zwyn) Channel and Béhuchet's intention was to bar Edward's way. Cobham reported back late that night on the state of the French fleet. The extant records report that Edward entered the roadstead at high tide the next day, 24 June, manoeuvring to be able to attack with the advantage of wind and tide and with the sun behind them. The traditional view is that the attack took place at 3:00 p.m.[b] According to naval historian Nicholas Harris Nicolas modern research reveals that high tide would have been at 11:23 a.m. on 24 June. [c] After nearly a day linked by chains and ropes, and with wind and rain working against them, the French ships were fouled against each other to the east of their starting positions. Béhuchet and Quiéret ordered the ships to be separated and the fleet attempted to move back to the west, against the wind and the tide. In this disorganised state they made contact with the English. Edward sent his ships against the French fleet in units of three, two ships full of archers flanking one full of men-at-arms. The English ships with the archers would approach a French ship and rain arrows down on its decks; the men-at-arms would then board and take the vessel. The modern historians Jonathan Sumption and Robert Hardy separately state that the English archers, with their longbows, had a rate of fire two or three times greater than the French crossbowmen and significantly outranged them: Hardy reckons that the longbows had an effective range of 300 yards (270 metres) compared with 200 yards (180 metres) for the crossbows. The battle resembled a land engagement at sea. Two opposing ships would be lashed together and the men-at-arms would then engage in hand-to-hand fighting while supporting troops poured in arrows or bolts. As the battle progressed Béhuchet's tactics proved disastrous for the French, as it allowed the English to attack single ships or small groups of ships with overwhelming force while the rest of the French were immobilised. The greater number of fighting men in the English ships, especially archers, also told. A London longbowman reported that the English arrows were "like hail in winter". Many French ships were boarded and captured after fierce fighting. Barbavera had refused to tie his highly manoeuvrable galleys in with the French ships and the Genoese managed to board and capture two English ships. As it became clear that the battle was going the way of the English their Flemish allies sallied from the nearby ports and fell upon the French rear. In a letter to his son, Edward said that the French "made a most noble defence all that day and the night after". Late at night the French rear line attempted to break out. Apart from the galleys only 17 other French ships escaped. The rest of the French fleet, 190 ships, was captured. Few, if any, prisoners were taken and the water was reported to be thick with blood and corpses. French losses were between 16,000 and 20,000 killed, a high proportion of these by drowning, including both French commanders; they were captured and Béhuchet was hanged from the mast of his own ship, while Quiéret was beheaded, in vengeance for the massacre they had overseen at Arnemuiden two years earlier and their raids on the English coast. Frenchmen who managed to swim ashore were clubbed to death by Flemish spectators. Only four English knights were killed, along with an unknown but small number of other English combatants. The English joked that if the fish in Sluys harbour could speak, it would be in French, from the feast of French bodies they had dined on. For days the tides washed up bodies. Edward was wounded in the thigh by either an arrow or a bolt. Sumption summarises that "The French had suffered a naval catastrophe on a scale unequalled until modern times". In the aftermath of the battle, the French suffered an invasion scare and rushed troops to their coastal districts. Philip ordered that Barbavera be arrested for desertion. An alms house was set up at Leure (near Harfleur) to care for survivors too injured to work as seamen. Tactically the battle allowed Edward to land his army, which went on to besiege Tournai, a city in Flanders that was loyal to Philip VI. Strategically the victory had little effect. Philip had greater resources than Edward and was able to rapidly rebuild the French navy around the ships which had escaped and those which were not involved in the battle. Within a month a French squadron under their new admiral, Robert Houdetot, captured 30 merchantmen from an English wool convoy and threw the crews overboard. French ships continued to capture English merchantmen in the North Sea and to run men and munitions to Scotland. English coastal communities rejoiced in the victory and in the relief from French raids they supposed it brought. They were mistaken; later in the year the French raided the Isle of Wight, Portland, Teignmouth, Plymouth and the Channel Islands. The English retaliated in September by raiding Brest, capturing many ships, including six fully laden Genoese merchantmen. In 1341 French, Castilian and Portuguese squadrons successfully interdicted English communications with Gascony. The battle was later commemorated on Edward's gold noble coin, which depicted the king seated in a ship. The inscription reads: IHC TRANSIENS PER MEDIUM ILLORUM IBAT (Jesus passing through the midst of them went his way). ^ There are no verifiable records of any ships from Castile in the fleet. ^ All the chroniclers, a number of whom witnessed the battle, state that the attack took place at three o'clock in the afternoon at the moment of high tide. ^ "According to the calculation of the astronomer royal, high tide in the Schelde on 23 June 1340, occurred at 10:35 a.m. and 10:59 p.m., and on the following day at 11:23 a.m. and 11:46 p.m."
^ Crowcroft & Cannon 2015, p. 389. ^ Lacey 2008, p. 122. ^ Bartlett 2000, pp. 17–22. ^ Sumption 1990, p. 184. ^ a b Neillands 2001, pp. 82–83. ^ Rose 1997, pp. 24–30. ^ Sumption 1990, p. 175. ^ Cushway 2011, p. 155. ^ Williamson 1944, p. 115. ^ Rodger 2004, pp. 96–97. ^ Sumption 1990, p. 265. ^ Sumption 1990, p. 320. ^ Sumption 1990, pp. 320–321. ^ Sumption 1990, pp. 321–322. ^ Sumption 1990, p. 323. ^ a b Dickie et al. 2009, p. 64. ^ Rodger 1999, p. 99. ^ a b c d e f Rose 1997, p. 24. ^ Sumption 1990, pp. 309–318, 322. ^ Sumption 1990, pp. 297, 322–323. ^ Sumption 1990, pp. 297, 323–324. ^ Sumption 1990, pp. 323–324. ^ Lambert 2011, pp. 121, 123. ^ a b c Rodger 2004, p. 99. ^ Burne 1999, p. 53. ^ Knighton 1995, p. 29. ^ Prestwich 2007, p. 311. ^ Lucas 1929, p. 397. ^ Jones 2013, pp. 381–84. ^ Nicolas 1848, p. 51. ^ Sumption 1990, p. 324. ^ Prestwich 2007, pp. 311–312. ^ a b Neillands 2001, pp. 83–84. ^ Sumption 1990, p. 532. ^ Hardy 1999, pp. 161, 180. ^ a b Hattendorf & Navy Records Society (Great Britain) 1993, p. 22. ^ Prestwich 2007, pp. 8, 311. ^ Sumption 1990, p. 326. ^ Burne 1999, p. 54. ^ Davies 2014, p. 420. ^ a b Hannay 1911, p. 246. ^ Prestwich 2007, p. 312. ^ a b Sumption 1990, p. 327. ^ Burne 1999, pp. 56–63. ^ Rodger 2004, pp. 99–100. ^ Sumption 1990, pp. 328, 346–347. ^ Rogers 2010, p. 16. Bartlett, R. (2000). England Under the Norman and Angevin Kings: 1075–1225. New Oxford History of England. Oxford: Oxford University Press. ISBN 978-0199251018. Burne, A. (1999) . The Crécy War. Ware: Wordsworth Editions. ISBN 978-1840222104. Crowcroft, Robert; Cannon, John (2015). "Gascony". The Oxford Companion to British History. Oxford: Oxford University Press. p. 389. ISBN 978-0199677832. Cushway, Graham (2011). Edward III and the War at Sea. Woodbridge, Suffolk: Boydell Press. ISBN 978-1843836216. Davies, N. (2014) . Europe: A History. London: The Bodley Head. ISBN 978-1847922908. Dickie, Iain; Dougherty, Martin J.; Jestice, Phyllis G.; Jörgensen, Christer; Rice, Rob S. (2009). Fighting Techniques of Naval Warfare: Strategy, Weapons, Commanders, and Ships: 1190 BC – Present. New York: St. Martin's Press. ISBN 978-0312554538. Hardy, Robert (1999) . "Chapter 10: The Longbow". In Curry, A.; Hughes, Michael (eds.). Arms, Armies and Fortifications in the Hundred Years War. Woodbridge, Suffolk: Boydell Press. ISBN 978-0851157559. Harris, Robin (1994). Valois Guyenne. Royal Historical Society Studies in History. 71. London: Boydell Press. ISBN 978-0861932269. Hattendorf, J.; Navy Records Society (Great Britain) (1993). British Naval Documents, 1204–1960. Aldershot: Scolar Press for the Navy Records Society. p. 1196. ISBN 978-0859679473. Retrieved 5 July 2013. Jones, Dan (2013). The Plantagenets: The Warrior Kings and Queens Who Made England. New York: Viking. ISBN 978-0670026654. Knighton, Henricus (1995) . Geoffrey Martin (ed.). Knighton's Chronicle: 1337–1396. Oxford: Clarendon Press. ISBN 978-0198205036. Retrieved 5 July 2013. Lacey, Robert (2008). Great Tales from English History. London: Folio Society. OCLC 261939337. Lambert, Craig L. (2011). Shipping the Medieval Military: English Maritime Logistics in the Fourteenth Century. Woodbridge, Suffolk: Boydell Press. ISBN 978-1843836544. Retrieved 5 July 2013. Lucas, Henry Stephen (1929). The Low Countries and the Hundred Years' War: 1326-1347. Ann Arbor, MI: University of Michigan. OCLC 1597307. Neillands, Robin (2001). The Hundred Years War (Revised ed.). London; New York: Routledge. ISBN 978-0415261319. Retrieved 5 July 2013. Nicolas, N.H. (1848). A History of the Royal Navy: 1327-1422. II. London: Bentley. OCLC 609593487. Retrieved 7 February 2017. Prestwich, Michael (2007) . Plantagenet England 1225–1360. Oxford: Oxford University Press. ISBN 978-0199226870. Retrieved 5 July 2013. Rodger, Nicholas A. M. (1999). The Safeguard of the Sea: A Naval History of Britain. 660–1649. I. New York: W W Norton & Company. ISBN 978-0393319606. Rodger, N.A.M. (2004). The Safeguard of the Sea: A Naval History of Britain. 660–1649. London: Penguin. ISBN 978-0140297249. Rogers, Clifford J., ed. (2010). The Oxford Encyclopedia of Medieval Warfare and Military Technology. III. New York: Oxford University Press. p. 16. ISBN 978-0195334036. Rose, Susan (1997). "Battle of Sluys". In Grove, E. (ed.). Great Battles of the Royal Navy: As Commemorated in the Gunroom, Britannia Royal Naval College, Dartmouth (illustrated [some in colour] ed.). London: Arms and Armour Press. ISBN 978-1854094179. Sumption, Jonathan (1990). Trial by Battle. London: Faber and Faber. ISBN 978-0571200955. Williamson, James Alexander (1944) . The Evolution of England: A Commentary on the Facts. Oxford: Clarendon Press. OCLC 984703073. Retrieved 5 July 2013. Wikimedia Commons has media related to Battle of Sluys.